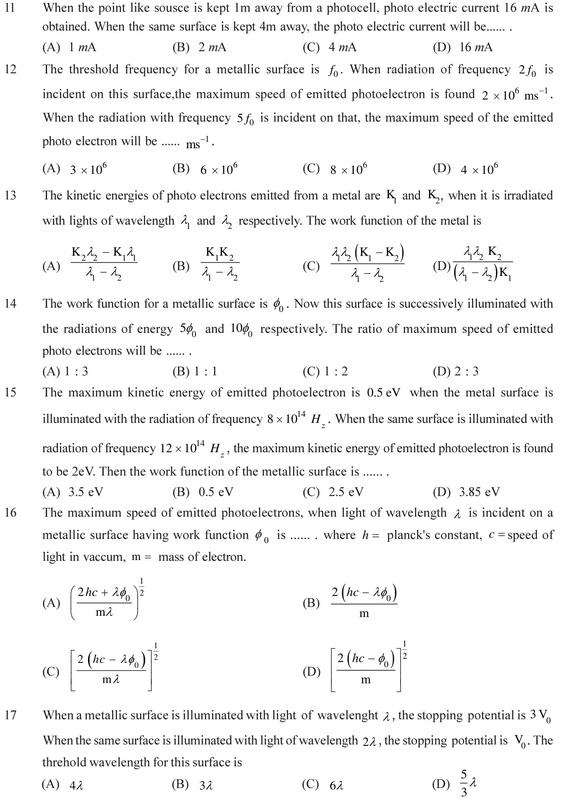 NCERT Solutions for Class 12 Physics Chapter 11 Dual Nature of Radiation and Matter in PDF form to download free. 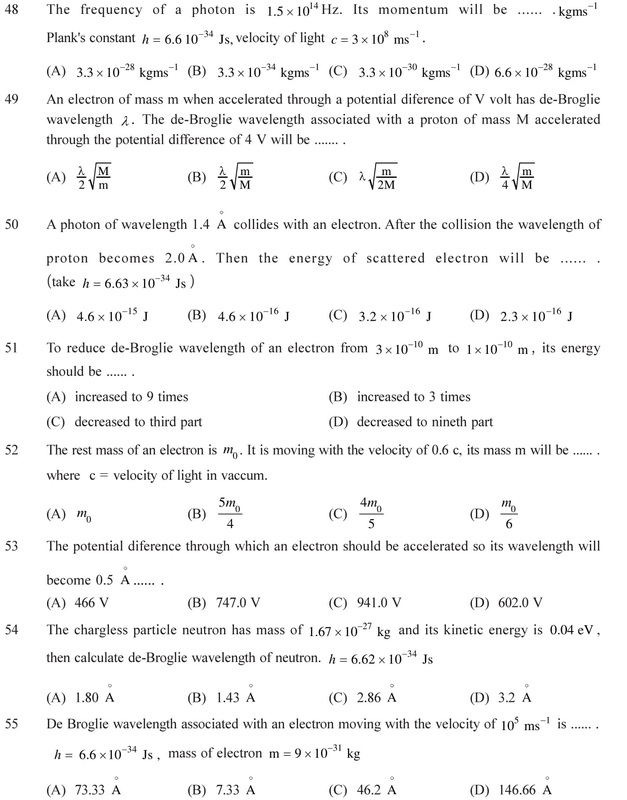 Solutions for other subjects like Chemistry, Biology, Maths, etc. are also in downloadable format. 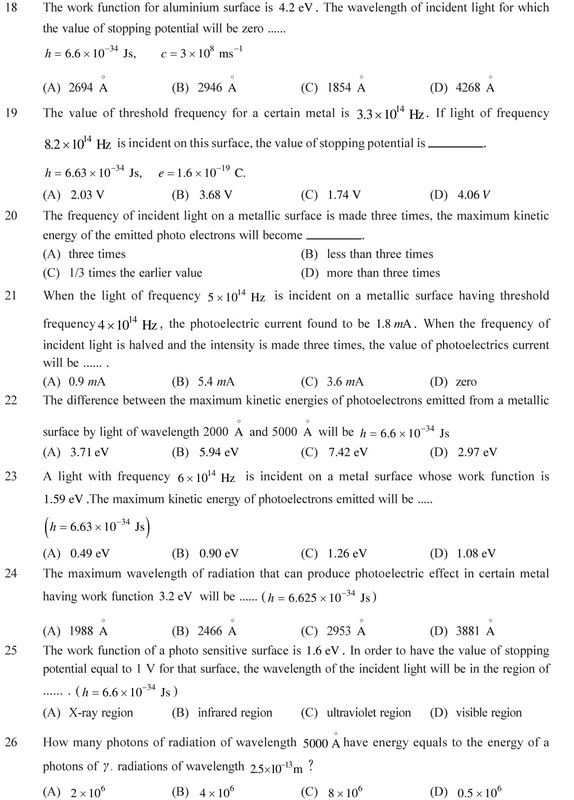 Download NCERT Solutions for Class 12 Physics Chapter 11 Dual Nature of Radiation and Matter in PDF form with the links given below. 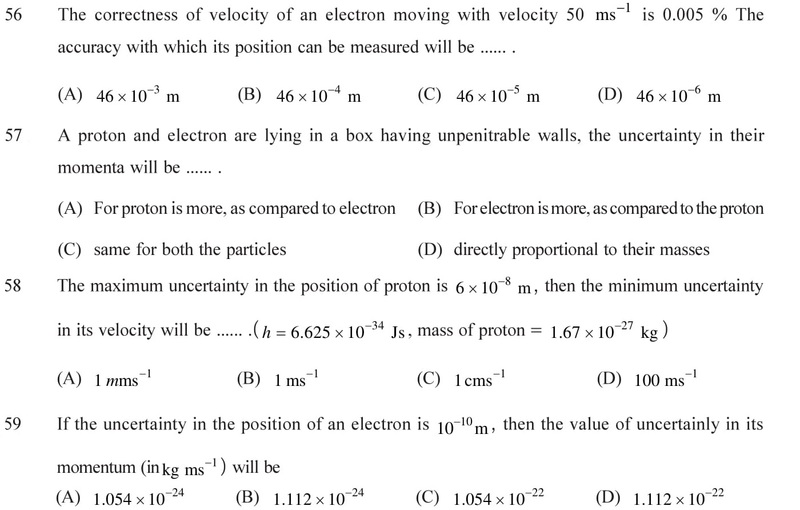 Questions given below provide an ample practice of the concepts of Dual nature of radiation and matter. It is divided topic wise for the convenience of students. 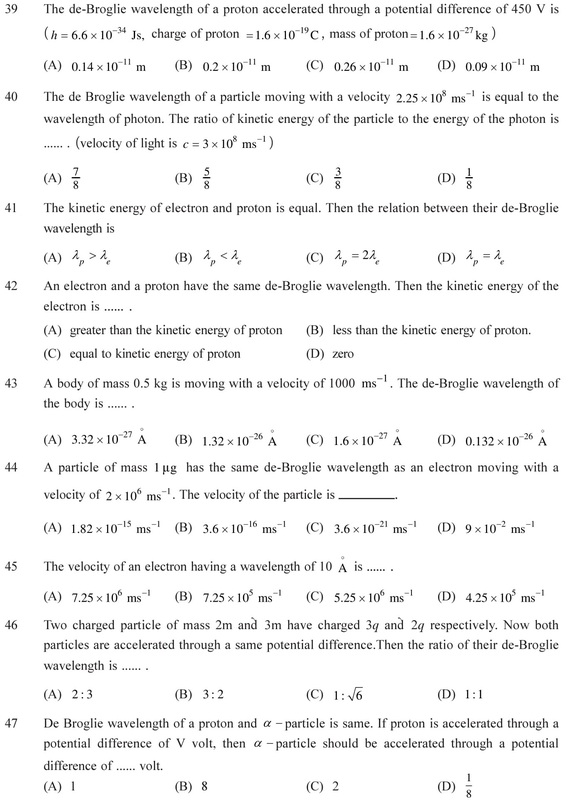 Complete the topic and practice the related questions. 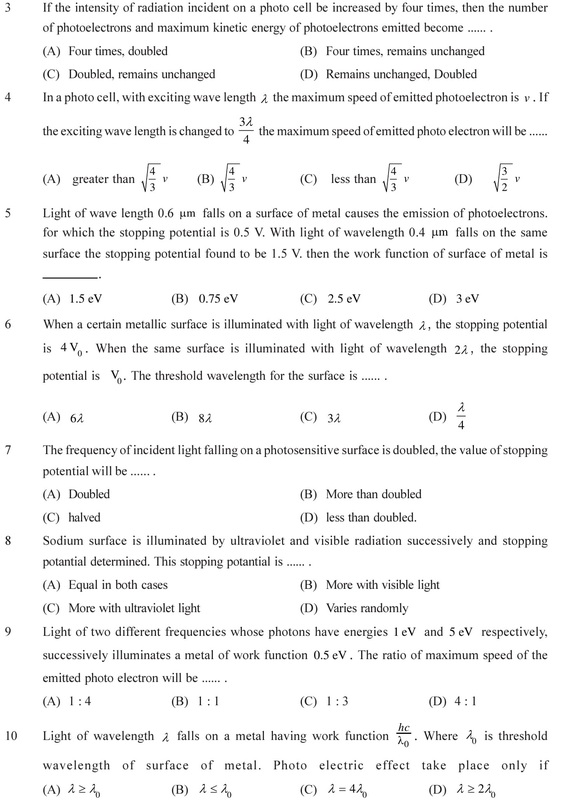 Photoelectric effect and emission of electron, Work function (Threshold frequency), stopping potential, threshold wavelength, effect of intensity of light on emission, effect of potential and effect of frequency on emission. Dependency of photosensitive surface and Einstein equation of photoelectric emission. See Answers. Particle nature of light, properties of photons and comparison of light in terms of photons. Emission of photons depending on intensity or frequency of light. 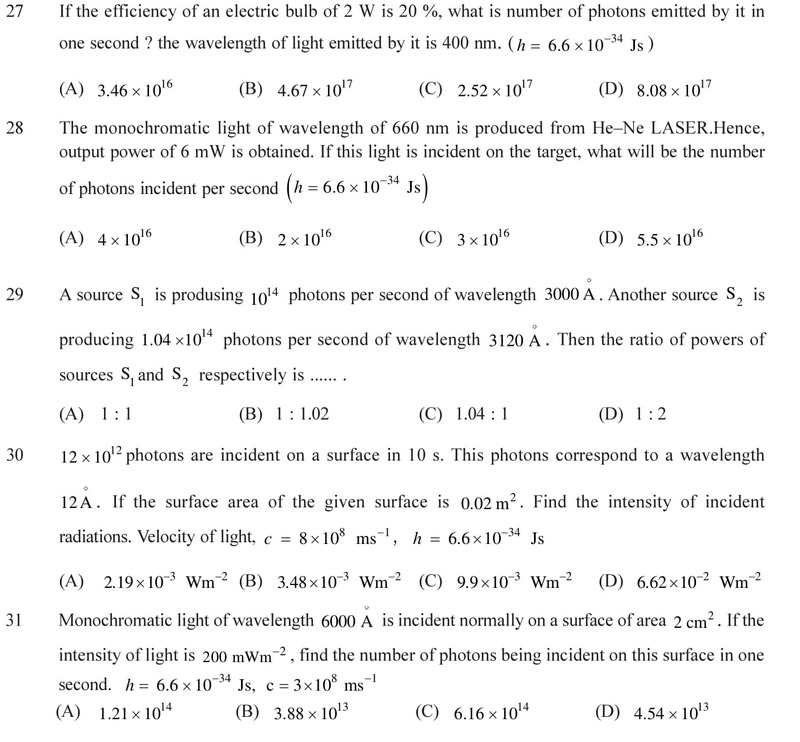 Calculation of number of photons during the emission. See Answers. de-Broglie hypothesis (According to de-Broglie a moving material particle some times acts as a wave and some times as a particle). 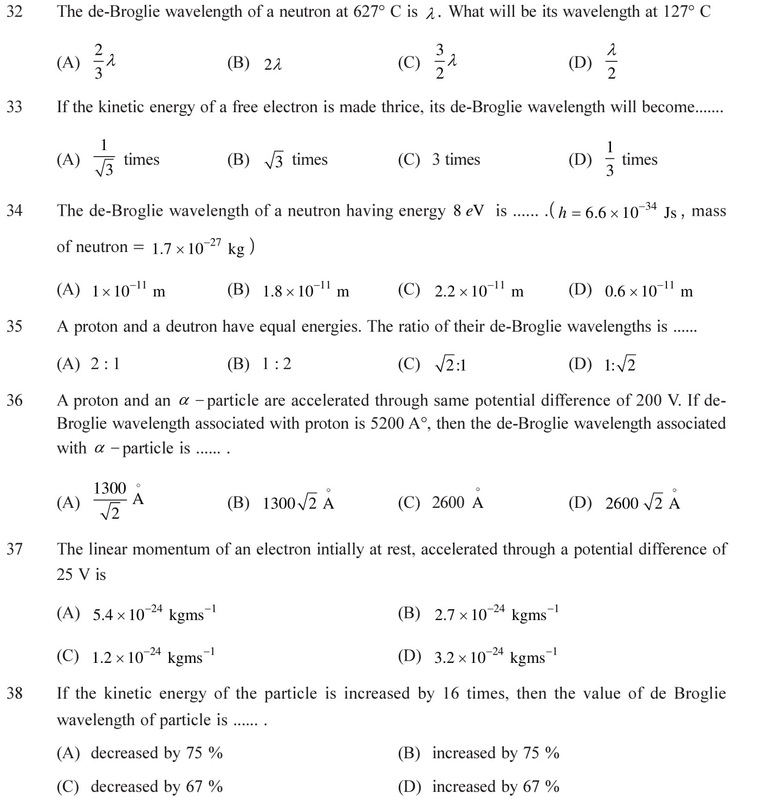 de-Broglie equation depending on kinetic energy, wavelength, stopping potential, etc. See Answers. Davission and Germer experiment to prove that the light have particle nature using the beam of electron and verifying the de-Broglie’s hypothesis. Heisenberg’s principle (According to Heisenberg’s uncertainty principle, If the uncertainty in the x – cordinate of the position is Δx and uncertainty in the x- cordinate of its momentum is Δp). See Answers. 1 (B), 2 (C), 3 (B), 4 (A), 5 (A), 6 (C), 7 (B), 8 (C), 9 (C), 10 (B), 11 (A), 12 (D), 13 (A), 14 (D), 15 (C), 16 (C), 17 (A), 18 (B), 19 (A), 20 (D), 21 (D), 22 (A), 23 (B), 24 (D), 25 (D), 26 (A), 27 (D), 28 (B), 29 (A), 30 (C), 31 (A), 32 (C), 33 (A), 34 (A), 35 (C), 36 (B), 37 (B), 38 (C), 39 (A), 40 (C), 41 (B), 42 (A), 43 (B), 44 (A), 45 (B), 46 (D), 47 (D), 48 (A), 49 (B), 50 (B), 51 (A), 52 (B), 53 (D), 54 (B), 55 (A), 56 (A), 57 (C), 58 (B), 59 (A).